Benjamin C. Kinney is the pen name of a neuroscientist at Washington University in St. Louis. Originally from Boston, he’s crossed the country back and forth since his Ph.D. to research cyborg monkeys, human amputees, hand transplant patients, and the ubiquitous college undergraduate. Go check out his website or follow him on twitter! Early 21st-century medical science has plenty of ways to surgically integrate a device into your body: cochlear implants, hip replacements, deep brain stimulation, pacemakers, and so forth. Right now, the first few human beings have chips implanted in their brains that allow them to control a robotic limb directly with their thoughts. From here on out, we’ll focus on the space-opera stuff: mechanical or other devices controlled directly by the human brain. Neural decoding requires a lot of information. The system doesn’t just need to know your goal (e.g. “pick up coffee cup”), it also needs to know where you want to move your arm (kinematics, e.g. “reach to the left of my water bottle”) and how you would use your muscles and joints (dynamics, generally below our conscious control). Imagine how it would feel to have a system that didn’t use your own kinematics: it’d seem less like controlling a limb, and more like pressing a ‘bring me coffee’ button. Which would be a big step up for a paralyzed person, but it’s a far cry from making the cybernetic arm a natural part of your life. Your brain doesn’t have single cells that do specific things, outside of the most basic sensory perception. Information is shared across the activity and connections of hundreds or thousands of neurons (and other cells). When your brain controls a movement, no single cell that carries all the relevant information. To decode the neural signals for arm movement, you need to measure the neural activity in most of those hundreds or thousands of cells. This is a big technological sticking point: how to record so much activity from the brain? 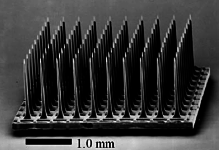 Current brain-computer interface (BCI) methods involve implanting a chip onto the surface, with dozens of tiny microelectrodes sticking down into the brain tissue below. These electrodes don’t penetrate neurons, but they get close enough to measure electrical activity. 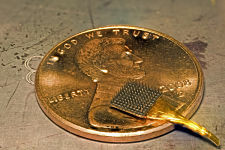 Stick a hundred microelectrodes into the motor-control part of the brain, and you should be able to pick up activity in 50-150 random neurons. Space-opera cybernetics will require one of two solutions: either a much bigger sample of neurons, or some way to identify exactly the right neurons to measure. Everyone’s brain is unique, so either solution must be custom-tailored to each individual. You might be able to minimize the above two problems by recording from a peripheral nerve (i.e., a nerve outside the brain). For instance, to control your cyber-arm, we might try to decode signals in the nerves that would normally control your boring old human arm. Down there in your arm, you have far fewer neurons, and most of those carry the information you want. But like all things in life, there’s a tradeoff. First, it’s no use at all for patients with spinal cord injuries or other nerve damage. Second, the arm nerve will only carry information about dynamics (joints and muscles) and maybe kinematics (movements), but not higher-level goals. Without also knowing the movement goal, your system has a lot more room for error compared to a brain-based system with access to all three kinds of information. 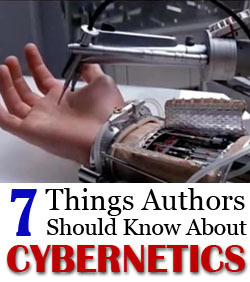 Can your fictional cyber-arm sense touch and motion like a human arm? If not, you’ll encounter some problems, similar to a person with nerve damage. If you can’t feel touch, you won’t be able to grasp and manipulate objects. If you can’t feel motion, your arm will fly all over the place. But you aren’t completely out of luck, because there’s another way to find out where your hands are and what they’re doing. If you can’t feel your hands, you can learn to use them effectively as long as you’re looking at them. If I can record from the neurons in the motor-control areas of your brain, you’ll have no problems learning the basic control of a prosthesis. 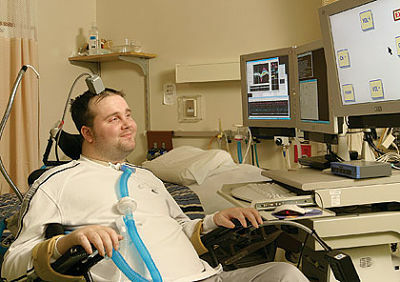 Matt Nagle, the first human to receive a modern microelectrode-array neural implant, was able to control a computer cursor immediately after a few seconds of software calibration, because neural decoding interprets the brain’s natural movement-control signals. Hand transplant patients illustrate another trick: most of the tendons that control hand movement (other than drawing the thumb toward/away from the hand) are controlled in the forearm, so a replacement hand could use intact nerves. Can the human brain control truly inhuman things: an extra pair of arms, a pair of wings, a starship, Doctor Octopus? Goal-level control is certainly possible; Doc Ock thinks about his coffee cup, and his robot arms will go get it. But it may be impossible to move your starship’s steering flanges as naturally as you control your own arm. This is because the human brain is an evolved system that developed in parallel with our bodies, toward the goal of producing actions that improve our survival or reproduction. Nearly everything in our brains is rooted in our motor and sensory capabilities, and vice versa. If you ask people to make yes/no answers by pressing a button, difficult questions (e.g. controversial moral judgments) lead to different movements: when you hesitate over a difficult call, even your arm hesitates to commit. Action is not like software uploaded into the brain; it is the brain. Radically different movement control would require a radically different brain. However, nobody knows for sure! Maybe controlling that second pair of arms is more like learning a second language: if you start young, who knows what the human brain can accomplish?